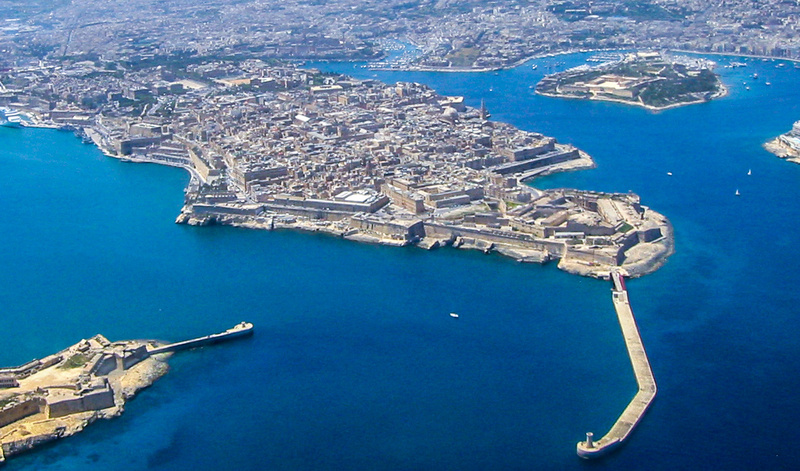 Fort St. Elmo reef is situated at the tip of the Valletta peninsula, between the entrances to Marsamxett Harbour and Grand Harbour. At the seaward side, underneath the imposing walls of Fort St. Elmo, is a good reef dive. This reef is a lesser known and dived site, as most people coming to Valletta are diving the World War II wreck HMS Maori in St. Elmo Bay. St. Elmo reef starts at around 13 m and continues east north east direction. Top of the reef gets slowly deeper to 17 m with a drop-off to 35 m depth. There are lots of boulders and gullies for divers to explore, with good marine life sightings including moray eels, octopus, red groupers, damselfish and shoals of salema fish. Some wreckage lies around on the sandy bottom near the reef. Fort St. Elmo is best dived in the early morning, as in the afternoon the sun stays behind the walls of the fort, and the reef is in shadow. There are several entry/exit points for Fort St. Elmo reef dive. The first one is near the corner of the fort, with concrete steps down onto the rocks, where divers can choose either rock-cut steps directly into the sea, or using steel ladder (when in place) leading into a small rock-cut pool with a breach to the open sea. This entry/exit can be used also when diving HMS Maori wreck. Another entry/exit point is close by, rather steep rock-cut steps leading into the sea. Exiting out of the sea at this point can be quite difficult even in calm sea conditions. The official road along the shoreline ends close to the first two entry/exit points, and the road continues as an off-road track further to St. Elmo breakwater sheltering Grand Harbour. Third entry/exit is through another rock-cut pool, located almost in line with the middle of the Fort St. Elmo’s seaward wall (see panorama picture). Rock-cut steps lead to the pool, and access from the pool to the open sea is through a breach in the rocks. Fourth entry/exit point is further away from the other three, close to the St. Elmo breakwater, and consists of sometime uneven but gently sloping rocky shore. The rock-cut steps leading into the sea can be very slippery, and the ladder in the first pool is removed for winter. Fort St. Elmo reef should be dived only in calm sea conditions, with rough seas getting out of the water is difficult and dangerous even for experienced divers. When diving around Valletta, beware of the boat traffic entering and leaving the harbours, and always carry a DSMB when diving in harbour area. Visibility on St. Elmo reef dive varies a lot, depending on currents. In general, near the harbour area visibility is not as good as in many other dive sites around Maltese islands. ★★☆☆☆ This site is at it's best in the morning sun.